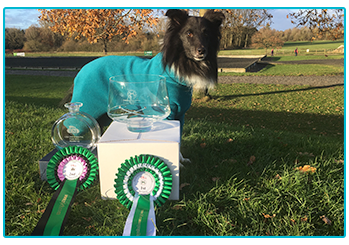 You may have previously read that, at The Insurance Emporium, we’ve been sponsoring a Crufts Champion called Teal and his owner, Hayley Telling, who have competed at a variety of agility events in the UK and beyond. While Crufts is the biggest dog show in the world, it’s only one of a few events that canine athletes train for each year and one of many of Hayley and Teal’s calendar. How have the pair been getting on over the last few months? We caught up with Hayley to find out. Over August, the duo had what Hayley described as “an absolutely fantastic month!” Looking at the accolades that Teal gained, it’s easy to see why! He qualified for his third and fourth events at Crufts and he won his third agility championship ticket, making him an Agility Champion. With his latest championship accolade, Teal’s pedigree name has been changed to Agility Champion New Illusions Bi Enchantment of the Five Colours. Teal has also been doing very well in qualifying for another major dog showcase. 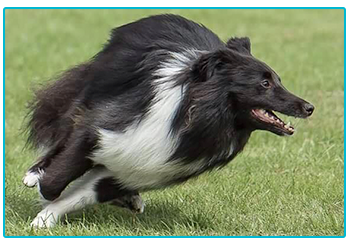 He came in second in the semi-finals of the Olympia’s medium agility stakes. This means he’ll be competing in the finals at the London Olympia Horse Show on December 18th, which Hayley says “has been our biggest dream and we can’t wait”. What’s more, he’s already qualified for the Olympia 2018 semi-finals, which Hayley says was actually one of their goals for next year! So it seems that they’re already ahead in their plans for 2018! 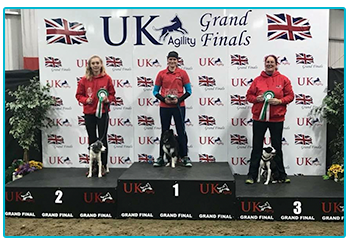 The pair also had a great time at the UK Agility grand finals, where they competed in the Canine Massage Guild Challenge Final, CSJ UKA Grand Prix Final and the Doggy Jumps Masters Final. Hayley and Teal got first place in the Canine Massage Guild Challenge Final and second place in the CSJ UKA Grand Prix Final. Looking ahead, they’ve got the London Olympia show before enjoying a rest month in January. Then, in February, they will be getting ready for Crufts 2018. Teal is set to compete in the British Open, the Singles, Team event and the Championship event at Crufts. As owners, we do our best to keep our pets happy and healthy. However, like Teal, sometimes our pets can be unfortunate enough to face an affliction. The Insurance Emporium’s dog insurance includes cover for Vet’s Fees*, which could be up to £8,000 on a Gold Lifetime lunar monthly policy. Want to see if our dog insurance could be right for you? Drop by The Insurance Emporium today! *excludes costs as a result of tooth or gum disease. In Teal’s case, his problem was due to a fracture.